Is My Child Getting Sick Too Often? What is Normal? During Cold and Flu season, it seems as if your child will not get well. One cold then the next, and then an ear infection. Will the congestion and cough ever end? We decided to do a little online research to see what is normal and what is not when it comes to illness in the early childhood ages. WHAT IS NORMAL? 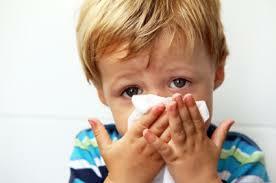 During infancy and the preschool years, the average child gets seven or eight colds each year. During the school-age years they average five or six colds each year. Finally as teenagers they reach an adult level of approximately four colds per year. If your child is unlucky, they “will be better than average” and have even more than their share: 10-15 % of children will have <12 colds/year. This doesn’t even include stomach flu or diarrheal illnesses. Most colds occur between October and April. Most colds are “bad the first week, and then improve in the second to third week.” Certain virus such as Influenza or Respiratory Syncytial virus may lead to a month of coughing as the damage these germs cause can take weeks to heal. CAUSES? Virus de jour. There are at least 200 cold viruses!!! Daang! As children have not had previous exposure to these germs they are quite susceptible to catching each and every one they come in contact with. These germs are mainly spread hand to mouth. That is a germy kid’s snotty hand to toy, and then your child takes that toy away, gets the germ on their hand, and then rubs their eye, nose or mouth, and the virus has a happy new home. Virus thrive on the horsie at King Soopers, toys at day I mean germ care, balls at the church nursery, and they come home courtesy of older siblings. Isn’t sharing nice! As miserable as they are, each illness does give your child permanent immunity against that specific virus, so the number of colds he or she has each year will tend to decrease with age. IS THERE SOMETHING WRONG WITH MY CHILDS IMMUNE SYSTEM? Likely not. A child with an immune deficiency doesn’t have any more colds than a healthy child, they just get more severe infections: two or more bouts of bacterial pneumonia, meningitis, blood stream infections, recurrent draining sores, need for I.V. antibiotics, poor growth and weight gain. Usually there is a family member who has an already known immune disorder. Recurrent colds or ear infections do NOT count as a concern for immune deficiency. WHAT CAN I DO TO HELP MY CHILD? In reality, not much. Love then, comfort them, and help them recover from their illnesses. It is not their fault after all. Small things might make a difference though. Below are a few ideas that have some research showing their usefulness. HEALTHY HABITS PRODUCE HEALTHY KIDS. The best cold and flu prevention strategy is simple regular active playtime, sufficient sleep and good nutrition. Help your family maintain a healthy diet, packed with immune-boosting foods such as fish, citrus fruits and leafy vegetables, to help prevent the onset of or diminish the severity of illness. JUICE PLUS: This is a fruit and vegetable concentrate now studied in over a million children worldwide. Participants in the Children’s Health Study report taking less over the counter medicines, less prescription medicines, fewer missed days of school, and had fewer “sick doctor visits”. Juice Plus is “Bad for my business!” In studies with adults in Berlin, participants had the same number of “minor colds” but had significantly fewer “moderate or severe colds” than did placebo participants. Studies in athletes also show quicker recovery from colds, and this data has been so powerful that three Olympic teams are currently taking Juice Plus. BREASTFEED your baby as long as you can. And your next baby too! Nursing for six to twelve months significantly lowers the risk of infection. Moms taking prenatal vitamins with DHA had fewer colds and shorter illnesses at1,3 and 6 months. SLEEP TIME: Having a sleep-deprived kid on your hands isn’t just frustrating — it can also be unhealthy: Some studies show that being sleep-deprived limits the body’s natural killer-cell activity– white blood cells, which help battle disease. Make sure your child gets the recommended amount of sleep. Babies normally need approximately 14 hours, toddlers require around 13, and school age kids 10 hours nightly. SALINE: Regular nasal irrigation with a seawater-derived saline solution improves nasal symptoms and may reduce a child’s risk of recurrence of upper respiratory tract infections, according to research published the Archives of Otolaryngology. 400 children aged 6 to 10 who used saline three times a day all winter long experienced fewer days of illness, missed school days, and complications. VITAMIN D: Got milk? Bottom line “Get your D.” People with low levels of this vitamin, which helps to regulate the immune system, are more susceptible to catching colds. The AAP recommends kids up to age 18 get 400 IU per day, which can be found in 2 ½ cups of dairy a day. One study with kids taking 1,200 mg/day all winter led to a 58% reduction of getting Influenza A.
VACCINATE: Especially against Influenza, Pneumococcus and Hemophilus Influenza. These germs often lead to repeated illness, severe illness, and complications such as ear infections and Pneumonia. WIPE-FLUSH-WASH: Proper hand washing does prevent the risk of catching a cold. Teach your child to wash his or her hands after every bathroom trip, before every meal, after playing at school, or recess, and after high fiving the other sports team. The CDC recommends singing “Twinkle, Twinkle Little Star”, as that’s the length of time it takes (20 seconds) to slough germs off hands while washing hands with warm soapy water. Hand sanitizers might also help limit the spread of germs. One of the biggest challenges is that kiddies touch germy toys and then their mouth so quickly that you can never wash frequently enough. COUGH AND SNEEZE into your shoulder or shirt. If the entire family and daycare did this there would be fewer airborne germs and less spread of the dread. DISINFECTION: Rhinoviruses can live up to 3 hours on your skin. They also can survive for up to 3 hours on objects such as toys and counters. Cleaning these surfaces in your home or school with a virus-killing disinfectant during cold season might help prevent the spread of infection. WHAT DOESN’T HELP? Antibiotics, cold and flu medicines, vitamin pills, vapor rubs or humidifiers. Sorry. TAKE HEART: The end of the cold and flu season is near and you can soon look forward to healthy kiddos again! Fun in the First Days – Getting To Know Each Other!